Filming can be the most challenging aspect of production; however, post production is just as difficult. As a result, having the best software for the job to edit your files is extremely important. I do get the question from time to time from our YouTube Subscribers as to what software we use. The answer is simply "Sony Vegas." Most producers have their program of choice, Sony Vegas just happen to be mine. I've tried the Adobe Premiere and very little of Final Cut, but I must say, for my meager computer, editing and working with HD content is a breeze on Sony Vegas. Now mind you, when I first started using Sony Vegas, it wasn't a walk in the park. However, after watching some tutorials and practicing myself, I picked up all the tiny shortcuts necessary to make a production run smoothly. get away using Windows Movie Maker. However, there is some flexibility and features in this software that make video production worthwhile. 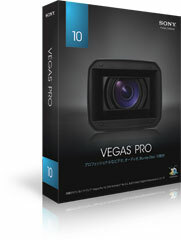 My recommendation is to find video editing software that fits your needs. You don't need anything expensive or complicated to make good videos. Good videos are made during the filming process. When you take the time to plan out your shoot, you make video editing simpler for yourself. It use to take almost six hours to complete post production on a video, now it takes me an hour. That's because my brother and I have a good film concept. We take care of all the hard work during filming, to make post production easier. In another blog post I'll discuss our pre-planning.